Subject: Patio covers and other roof modifications, pergolas (shade arbors), gazebos, etc. Whereas Article IV, Section 3 of the Declaration of Covenants, Conditions, and Restrictions for WestSide at Buttercup Creek requires and authorizes the Modifications Committee to develop Standards for interpretation and regulation of the Restrictions, this Standard is hereby recorded for public distribution. This Standard is to serve as an interpretation of the contents of the Declaration and as a guideline for the actions of representatives of the Association, including the Modifications Committee, the Management Company, and the Board of Directors. This Standard does not replace or amend the Restrictions, and should dispute arise, the contents of the Declaration shall take precedence over this Standard. In case of dispute, the decision of the Board regarding the validity of this Standard and the suitable interpretation of the Declaration shall be final. This Standard is intended to define the requirements for solid patio covers and other residential roof modifications, as well as stand-alone structures such as shade arbors and gazebos. All modifications and construction materials must be approved by the Modifications Committee prior to construction or installation as described in the Declaration . All materials used for construction within the neighborhood must conform to local code requirements and no statement made here is intended to define or modify those requirements. The construction styles and materials listed here are based on the construction styles and materials used by the builders of new construction throughout the development of the neighborhood, the requirements of the Declaration, and the approval history of the Modifications Committee. The standard building materials for these structures is defined in the "Standard Building Materials" Standard. Required shingle styles are also called out in the Supplemental Declarations for each Neighborhood Section. The Declaration requires that all improvements meet the building setback requirements of the lot as indicated on the associated plat or Supplemental Declaration. This is typically five (5) feet from the side fence and eight (8) to ten (10) feet from the back fence, depending on the section of the neighborhood . The Declaration also restricts the height of outbuildings to ten (10) feet and a maximum of 120 square feet in area . The Modifications Committee may at their discretion consider requesting a variance from the Board of Directors for larger structures on a case-by-case basis under the guidance provided here. However, when the proposed height exceeds the ten-foot limit, effort shall be made to ensure that the structure, or at least the tallest part of the structure, is placed further away from neighboring lots/fences/setbacks. The guideline for this shall be an additional five (5) feet for every additional foot of height. Trees are protected by both the Declaration  and the City of Cedar Park. Trees may not be cut down to make room for other structures, and any excessive pruning must be expressly approved prior to construction . All modifications are required to have any permits and inspections required by the City of Cedar Park in addition to approval by the Modifications Committee . All structures should be properly anchored to prevent them from moving or falling over. All structures shall be maintained in attractive and safe condition . Unsightly or unsafe structures must be repaired or removed. Paint, stain and/or sealant shall be reapplied as needed to prevent degradation in the appearance. Submissions must include all information necessary for the Modifications Committee to make an informed decision on the request. This includes a detailed plat map showing the proposed location of the modification relative to the residence and lot boundaries; drawings, illustrations, or pictures of the proposed modifications, including all dimensions (length, width, height, roof pitch, etc. ); lists of materials, paint colors, styles, etc. ; pictures of existing residence and proposed location; indication of visibility from public areas; and any other useful information. Refer to the submission standard for more information. Solid patio covers are considered an addition or extension to the existing roofing of the house. As such, they must conform in style, appearance, color, and materials to that of the main residence such that they appear to be a part of the original construction . The standard patio size for the neighborhood is 120 square feet and patio covers exceeding this dimension require special consideration . Modifications conforming to the preferred styles described here and meeting the requirements of matching appearance and roof pitch of original construction may, on a case-by-case basis, be allowed to exceed the height and/or square footage requirements described above, but must conform to the restrictions placed on the residence as a whole, as well as any City requirements. Under no circumstances should a roof pitch be allowed of less than 3"/12". The preferred roofing style is a hip roof with roof pitches similar to that of the existing residence . Figures 1 and 2 illustrate typical hip roof installations on single and two-story homes. Figure 1 Illustration of a typical hip roof patio cover below the existing roofline of a two-story house. 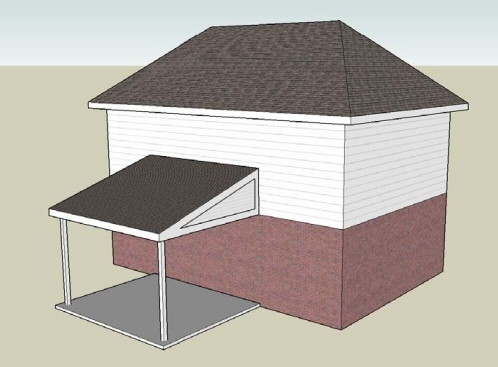 Figure 2 Illustration of a typical hip roof patio cover with a roof tie-in on a single-story house. An alternate to the hip roof is the single gable or cross gable roof, such as those typically seen over garages and dormers. This style may be preferable when the existing roofline contains similar architectural details, as shown in Figure 3. 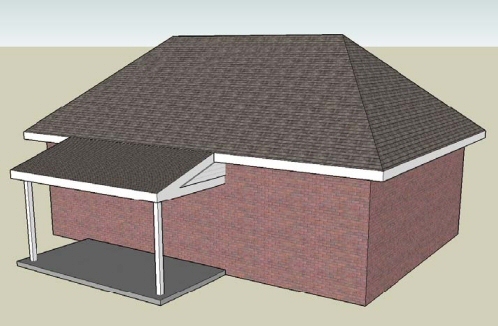 The roof should have a similar pitch to other single/cross gables and/or the main roofline, and should be enclosed on the end with siding and/or other architectural details similar to the existing roofline. Figure 3 Single gabled patio cover with similar architectural style to dormers on existing roof. Figure 4 Cross gabled patio cover with roof tie-in on a single story house. A shed roof is the simplest roof design and is considered acceptable for smaller patio covers when location of windows and other existing parts of the residence may make other options impractical. The cover should be enclosed on both sides as illustrated in Figures 5-7. A shed roof is not recommended for patios larger than 120 square feet . Figure 5 Example of a typical shed roof on a two-story house. Figure 6 Example of a typical shed roof with roof tie-in on a single story house. Figure 7 Example of a typical shed roof starting at the existing eave-line of a single story house. All roofs are required to have enclosed sides and finished fascia, eaves, and ceilings matching the existing fascia and eaves of the remainder of the house. Dropped ceilings are preferred, but in cases where windows and other clearance issues would prevent it, vaulted ceilings are allowed provided the exterior surfaces are enclosed to maintain the appearances described above. Lean-to roofs are not allowed . Figures 8 and 9 show patio roof designs that are considered unacceptable. Figure 8 Example of an unacceptable lean-to roof design. This construction style is inconsistent with the roofing construction of the neighborhood. Figure 9 Illustration of an unacceptable lean-to roof design. Roof modifications are required to have a finished look matching that of the main residence. Pergolas, also known as shade arbors, are typically stand-alone wood structures with architectural details. They do not have a solid (rain shedding) roof, and while they may be allowed to attach to the house for structural support, are not considered a part of the main residence. Thus, they are not required to match the architectural style of the house directly, but must complement the overall appearance of the neighborhood. Since pergolas are often wooden accent features to wood decks, wood finishes of cedar or redwood stain, or clear sealant over natural cedar or redwood are considered acceptable finishes, in addition to painting white or to match the trim color of the main residence. Pergolas are considered outbuildings and therefore restricted in size as described above. For structures meeting high quality/appearance standards, the Modifications Committee may at their discretion consider requesting a variance from the Board of Directors for larger structures provided the structure does not dominate the lot (recommended no more than 10% of the available lot area to the rear of the house, after setbacks have been excluded) and has minimal visibility from public areas and other lots. Since pergolas typically have a flat cover design, they should not normally extend above the ten-foot height limit. Construction materials for pergolas are natural wood (sealed cedar or redwood, or stained or painted pressure treated pine). Prefab lattice panels are discouraged, except as properly trimmed and bordered accent pieces. Full, unfinished lattice panels are not considered suitable roofing material. Plastic or composite lattice materials are prohibited. Figures 10 through 12 illustrate some typical pergola designs. 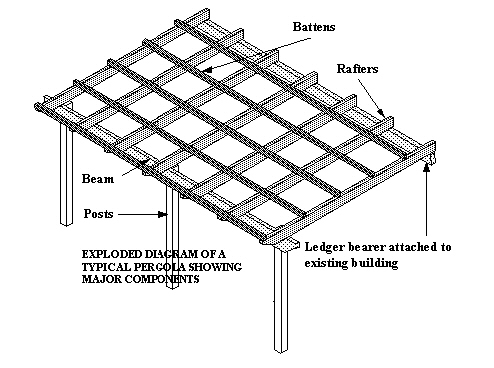 Figure 10 Illustration of a basic pergola design showing major components. Figure 11 Example of a typical natural wood pergola. Figure 12 Example of a painted pergola. Stand-alone patio covers should conform to the requirements for a hip roof cover, with similar rooflines and appearance to the house. In instances where the architecture of the house would be complemented by the design, a single gable roof with enclosed ends may be acceptable. Shed roofs are not allowed for freestanding structures under any circumstances. Gazebos typically have hip roofs with more than four sides. Since gazebos have a specific architectural style and are a component of the neighborhood parks, they may be constructed with roofs matching the residence, or with cedar shake shingles. Gazebos and other stand-alone covers are considered outbuildings and therefore restricted in size as described above. For structures meeting high quality/appearance standards, the Modifications Committee may at their discretion consider requesting a variance from the Board of Directors for larger structures provided the structure does not dominate the lot (recommended no more than 10% of the available lot area to the rear of the house, after setbacks have been excluded) and has minimal visibility from public areas and other lots. When effort is made to match the roof pitch of the residence, gazebos and similar structures will often be nearly as tall as they are wide. When practical, allowance will be made for this necessity, subject to the guidelines above, to ensure that the aesthetic appearance is maintained. Figures 13 and 14 illustrate some typical gazebo designs. Figure 13 Example pagoda style gazebo with shingles and paint matching the house. 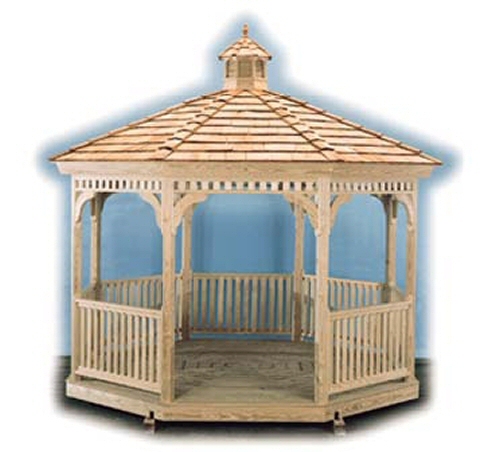 Figure 14 Natural cedar gazebo with cupola and cedar shake shingles. Any construction materials not typically used in existing residential construction in our neighborhood. This section is intended to provide the background behind the preceding Statement, either by direct references to the Declaration and/or by explaining the reasoning behind specific requirements. These references may not represent the entire set of supporting documentation provided by the Declaration and/or previous decisions by the Modifications Committee or the Board of Directors. Article IV, Sections 3 & 4; Article X, Sections 2 & 24. Section 9, "Setbacks" of the various Supplemental Declarations for each neighborhood section. The Supplemental Declaration and the plat survey give specific information on each lot. It is important to review the Supplemental Declaration for each Builders Subdivision or "Section" and the plat survey. These define the building lines and setbacks for each lot in that "Section". In all cases, the plat map takes precedence. Also, note that the building line is not the fence line. Article X, Section 18 & 23. The destruction or heavy pruning of native trees, especially hardwoods, is not allowed. Dead or damaged trees must be replaced within sixty (60) days. The City of Cedar Park has additional restrictions you should investigate prior to removal of any trees. Approval from the Modifications Committee or Board of Directors does not go to the city. It is up to each Homeowner to get city approval as well as Homeowner Association approval. Do not rely on your contractor to do this! You are responsible for all permits and approvals. If your contractor does offer to get City approval, request to see a copy of the permit prior to allowing construction to commence. City fines for construction without permits start at around $1000! In order to maintain the quality and appearance of the neighborhood, modifications to the residence must be of equivalent quality and style to the original construction. Article X, Section 24 also imposes requirements for roofing to match the existing residence. The standard back porch provided by most builders in the neighborhood is 120 square feet. Article X, Section 24 restricts outbuildings to 120 square feet as well. Depending on how closely a proposed modification matches the existing house design, larger roofs may require a variance or be further restricted in style and appearance. The standard roof style of the neighborhood is a compound hip roof, commonly with cross gables for garages, dormers, and other front elevation features. A hip roof provides a similar appearance aspect from all directions and most closely matches the design of most house roofs. Article X, Section 24 requires similar roof pitches and appearance to the main residence. Shed roofs are lower cost roofing solutions that are typically inconsistent with the building style of the neighborhood. While certain conditions may make this the only practical solution, shed roofs must still maintain a minimum level of quality and appearance. Since they do not conform to preferred building styles, they should also have a minimum visibility from any public area and may be restricted in overall size. Lean-to roofs are not consistent with the roof construction style seen in the houses built in our neighborhood. This type of construction is below the minimum quality standards of the neighborhood. The contents of this Standard have been extracted from internal documents and decisions used as guidance by the Modifications Committee since its inception. This information has been collected here to allow publication of a common reference for use by Members of the Association.